A stock trader buys and sells stocks, which represent equity in businesses, on behalf of investors and the firm that employs him or her. We often see traders in movies frantically yelling out buy and sell orders on the crowded and noisy floor of a stock exchange, like the New York Stock Exchange (NYSE). That is not how it works these days. Only a small number of traders still do auction-style trades on the floor of an exchange. Most spend their days in offices, trading stocks electronically. They spend their days in front of a computer screen. For more about the move from face-to-face to electronic trading read The Death of the Trading Floor by Stephen D. Simpson (Investopedia). Securities and investment firms employ most of them. This occupation has a good job outlook, according to the Bureau of Labor Statistics (BLS). Employment is projected to grow as fast as the average for all occupations between 2016 and 2026. "Execute purchases and sales of investment products in a timely and efficient manner"
"Research and resolve issues in trading area"
"Create new market making strategies for electronically traded products"
"Provide clients with general information and help with their brokerage accounts"
"Build quality relationships with industry participants"
To work in this occupation you typically need a bachelor's degree. Make sure to take courses in business, finance, accounting and economics. You will probably receive on-the-job training from the company that hires you. Anyone who wants to sell stocks or other securities must take and pass a test called the Series 7 or, more formally, the General Securities Representative Examination. The Financial Industry Regulatory Authority (FIRA) administers this six hour exam. 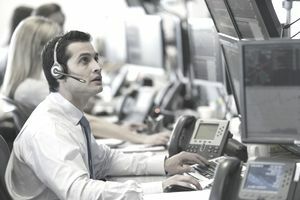 Many employers help their traders prepare for the Series 7. Listening Skills: As a stock trader, you will have to listen carefully to what your clients tell you. Making a mistake because you weren't paying attention can be extremely costly. Verbal Communication Skills: Your clients will have to make important decisions based on the information you provide. Decision-Making Skills: You must be able to think on your feet and make decision swiftly. Critical Thinking: Because the consequences of your decisions can be great, it is essential that you weigh all your choices carefully before choosing the best one. Customer Service Skills: Your clients must feel comfortable with you. "Possess a strong work ethic and be able to learn quickly in a fast paced, high pressure environment"
"Aggressive, self-motivated individual who functions well in a team environment"
"Adaptable, willing to learn, and passionate"
"Maintain composure and communicate clearly when under pressure"
Sources: Bureau of Labor Statistics, U.S. Department of Labor, Occupational Outlook Handbook; Employment and Training Administration, U.S. Department of Labor, O*NET Online (visited February 20, 2018).